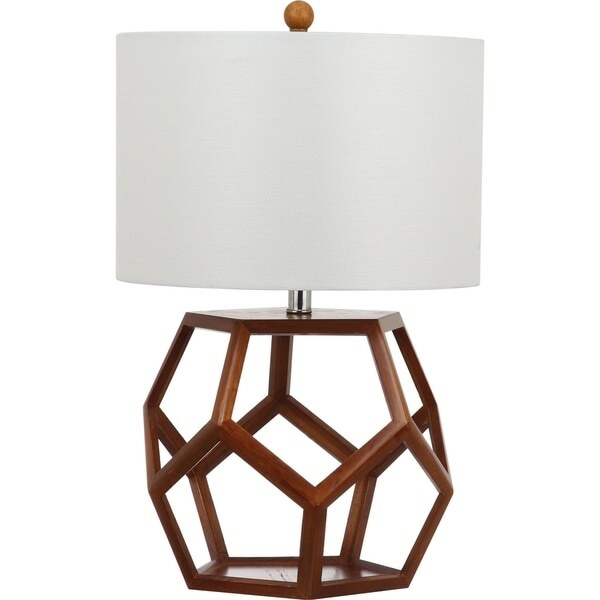 Strongly graphic, the warm brown wood base of the Delaney table lamp recalls the hexagonal pattern of a honeycomb. With its textured white cotton drum shade, wood finial and silver neck, this chic geometric design is perfect in contemporary interiors. Dimensions 23.75 in. H. x 15 in. W. x 15 in D.
The lamp is generally as expected. Wood base, nice white shade. However, it is not as pictured. The cord has been removed from these photos. I had hoped that the construction allowed it to be hidden in structure of the lamp, as pictured, but actually the grey electrical cord runs right through the center of the lamp. This somewhat ruins the airy, geometric effect for me. I wasn't as impressed as I had hoped. My biggest issue is that the wire comes from the top center of the base and is visible right through the cutout design which is less than appealing. Def a design flaw that would've changed my mind had I realized before I purchased. The other issue that is more personal preference than anything is that the shade is so large and opaque that in a dark rm it gives off very little light and the lamp shade looks too yellow when turned on. I purchased a higher watt edison bulbs and a metal mesh shade that may turn it around for me, we shall see. This lamp arrived slightly damaged. I kept it. It looks great but where the lightbulb sits it wobbles. I think that's from the damage during shipping, but I can't be sure.